Santa Clara, CA and Paris, France, March 19, 2019 – 6WIND, a high-performance networking software company, today announced that Excitel Broadband, a high speed Internet Service Provider (ISP) servicing the India market, successfully deployed 6WIND Turbo Router software appliances to provide ultra-fast broadband services for its 200,000 users. 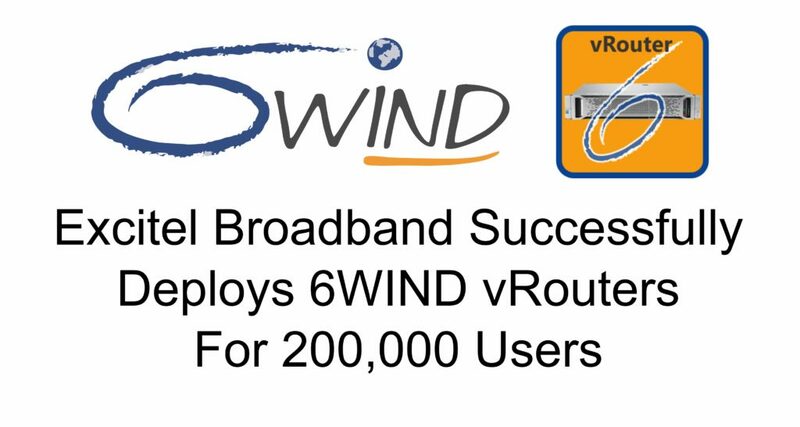 6WIND’s vRouters, or virtual routers, are deployed in Excitel’s network as Broadband Network Gateway (BNG) solutions through its integrator partner Extreme Broadband Services. For this deployment, 6WIND’s vRouters replaced the MikroTik routers that lacked the scalable BNG performance required for Excitel’s growing business requirements and now supports 3X users and 4X throughput on the same x86 server platform without any additional hardware investments. 6WIND’s vRouters are available in bare metal and virtual machine (VM) configurations and run on commercial-off-the-shelf (COTS) servers. They are available in Turbo Router and Turbo IPsec software packages with license options from 1G to 100G throughput and 1,000 to 100,000 IPsec VPN tunnels. Built with DPDK (Data Plane Development Kit) for networking performance, 6WIND’s vRouters scale up to 12 million packets per second per core of IP Forwarding and 18 Gigabits per second per core of IPsec. 6WIND’s networking software solves performance and time-to-market challenges for Service Providers, Enterprises and OEMs. The company’s flagship vRouter technology is available in software appliance, source code and hypervisor networking form factors optimized for cost-effective hardware, such as Commercial-off-the-Shelf (COTS) servers. 6WIND is based near Paris, France with regional offices in China and the United States. For more information visit: http://www.6wind.com.